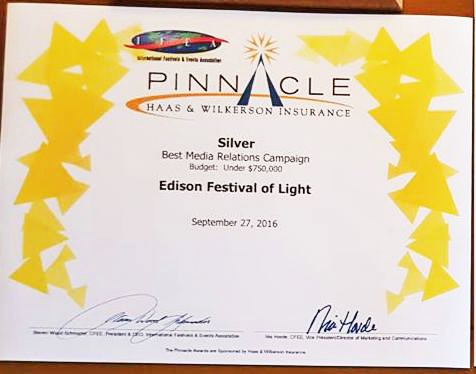 Congratulations to the Edison Festival of Light who received second place honors for Best Media Relations Campaign in their budget category at the 2016 International Festivals & Events Association convention in Tucson. We could not be more happy to have put together such a great–and award winning–social media plan for them. If you would like to see what we can do for your organization, please contact us for details.